I spent part of the July 4 holiday watching the 2003 HBO production of Tony Kushner’s Angels in America, directed by Mike Nichols. I’d seen the play (which is really two full-length plays) in Los Angeles prior to its triumphant Broadway debut in 1993. Then the 2018 revival starring Andrew Garfield and Nathan Lane, one which earned more Tony nominations than any other in Broadway history, piqued my interest. So I turned to the Emmy-winning HBO miniseries to relive Kushner’s vision. 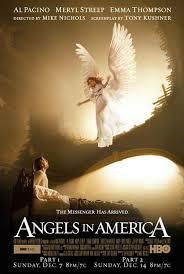 Angels in America is subtitled A Gay Fantasia on National Themes. It begins in October 1985, as the AIDS crisis is ramping up in New York City. The plot weaves together several realistic stories: that of a newly diagnosed gay man (Prior Walter) and his fearful partner (Louis); that of a closeted Mormon lawyer (Joe) and his neurotic young wife (Harper). 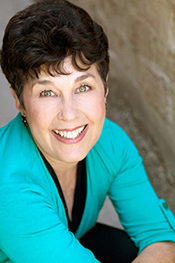 There’s also a male nurse nicknamed Belize -- a flamboyant “queen” who’s seen his share of young gay men dying -- as well as the Mormon lawyer’s down-to-earth Salt Lake City mother, Hannah, who’s far more complex than she at first seems. The story is enhanced by the presence of a genuine historical figure, attorney and right-wing power-broker Roy Cohn. As the play begins, Cohn is trying to maneuver the clean-cut Joe into a position in the U.S. Department of Justice, so that his own name can be cleared of wrong-doing. Once the action gets underway, it’s revealed Cohn’s dying of AIDS. An angry, vindictive little man, he admits to sleeping regularly with males, but hotly denies being gay. And so it goes. What lifts Angels in America beyond the realm of kitchen-sink drama or soap opera is Kushner’s inventive language and mythical bent. He’s got a gift, first of all, for witty remarks, like “You know you’ve hit rock bottom when even drag is a drag.” And he moves far beyond the concerns of the gay community by seeing his characters in historical context, somewhat paralleling the immigrants and other outcasts who have not been entirely welcomed into the fabric of American life. Through the character of Ethel Rosenberg, whose visitations to Roy Cohn in his hospital bed are a spooky reminder of his personal role in the execution of the Rosenbergs on espionage charges, we’re reminded of the more questionable moments in the history of American jurisprudence. Ethel is a realistic sort of ghost, but what to make of the avenging angel who descends through the ceiling to violently confront Prior Walter? In these sections of the drama, Kushner’s language goes a bit bonkers, and the audience has to hold on for dear life. I have a feeling that such phantasmagoria may work better on the stage, an environment in which we expect to see the unreal without having to make literal sense of it. That being said, I can’t praise highly enough the cast Mike Nichols assembled for the HBO version. He followed the stage play in having several of the featured actors taking on more than one role I won’t soon forget Meryl Streep as both a coyly vindictive Ethel Rosenberg and a plain-jane Mormon mom. Given how often she’s cast as grand figures—like Margaret Thatcher, Miranda Priestly, and even Florence Foster Jenkins—it’s wonderful to see what Streep can do in a humbler role. I was also much taken with Jeffrey Wright, as both Belize and a hallucinatory travel agent. An unrecognizable Al Pacino is both hideous and poignant as Roy Cohn, and the younger actors are memorable too. All left me with a lot to think about on July 5. Half Widow: A Whole New World . . .